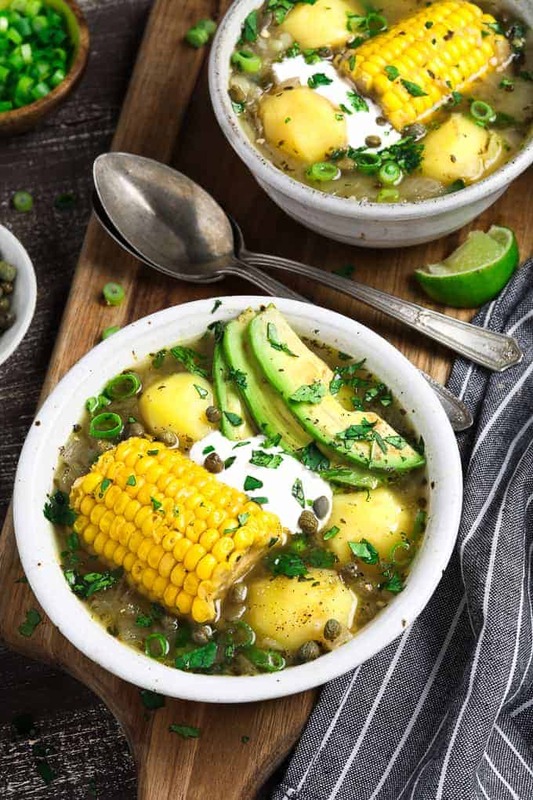 Vegan Ajiaco is a satisfying, one-pot meal that is made with 3 types of potatoes and served with sliced avocado, capers, and tangy cream. Your taste buds will dance! I’m a soupaholic and I love making a variety of soups all year round. They are inexpensive, super satisfying, great for make-ahead meals and freezable. Plus, you can feed a whole herd of people easily. 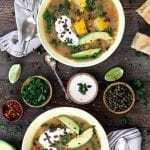 Some of my go-to recipes are my Potato Leek Soup, this French Onion Soup, and of course, Vegan Ajiaco! 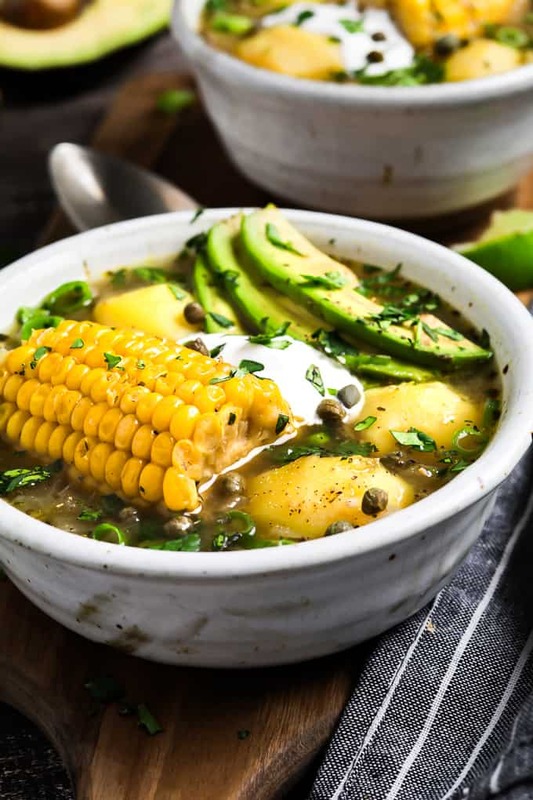 It’s a mouth-watering, hearty soup that is common to Colombia, Cuba, and Peru, and is prepared slightly different in each culture. 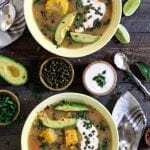 The recipe I’m sharing today is a Colombian version (Ajiaco Bogotano). This soup is well-known throughout the region, and especially in Bogotá, the capital of Colombia. The potatoes range from waxy to starchy – Papas Criollas, Sabanera, and Pastusa. Each potato has a purpose, the starchy potatoes are cooked until they completely break down and create a stew-like consistency, while the waxy stay intact and provide another layer of texture. It’s the epitome of comfort food! It’s really hard to find these potatoes in the U.S, but I’ve found Papas Criollas in a nearby Latin market in the freezer section. They are small, golden-yellow potatoes with a buttery, nutty, creamy taste and texture. If you can find them, I highly recommend trying them out at least once. They are a little expensive so most of the time I just use Fingerling or Yukon Gold to substitute them. My favorite part of Ajiaco is all the fixin’s that accompany it. It’s served with Avocado, Capers, Table Cream (I use Vegan Sour Cream) and sometimes served with Aji (Colombian Salsa). Each topping adds another layer of flavor to this already flavorsome meal. I highly recommend all of them for the full Ajiaco experience. I also like to add a squeeze of lime and fresh-cut cilantro. In many areas of the world, Guascas is considered a weed and is referred to as the Gallant Soldier or a Potato Weed. However, in South and Central America, it’s considered a culinary herb, and leafy vegetable with medicinal benefits. Fresh, aromatic Guascas is commonly used in Ajiaco, but it’s not readily available here, so dried Guascas is the next best thing. It’s really hard to describe the distinctive flavor of Guascas and it’s like no other herb I’ve tried before. It really stands on its own. If I had to describe it, I would say it has an artichoke-like flavor, with an earthy undertone and a lime-like aroma. It creates a rich flavor and adds a lot of depth to the soup. You can find dried Guascas in most Latin markets or you can find it on Amazon Here. It’s really worth searching for and will give your Ajiaco its authentic flavor. I tried to keep the recipe as traditional as possible, but I had to change a few things to make it vegan-friendly. The stock is traditionally made with chicken, and it’s simmered in water, onions, and garlic to create a broth. To replace this step, I sautéed the onions and garlic together and used vegetable broth. The cook time is much shorter without the addition of chicken, so that’s a big bonus. After sautéing the Onions and Garlic, add the Vegetable Broth, Red Potatoes, Russet Potatoes, Guascas, Salt, and Pepper. Bring it to a simmer and cook until the potatoes are breaking down. This thickens the soup and creates a stew-like consistency. Now add the Yukon Gold Potatoes (or Papas Criollas), Corn Cobs, Green onion, and Cilantro. Simmer until the potatoes are tender and corn is cooked. Check for seasoning and add more if needed. While the soup is finishing up, start preparing your selected garnishes. Remove from heat and add lime juice if preferred. 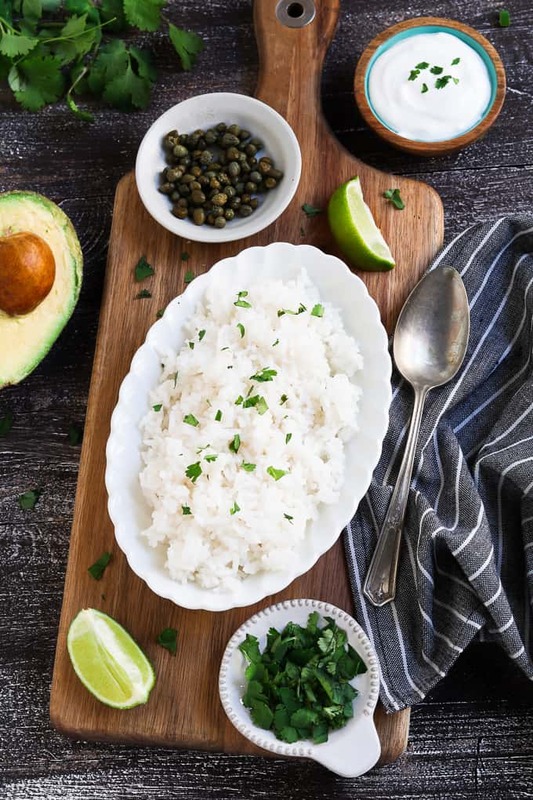 Serve hot with Vegan Sour Cream, Avocado Slices, and Capers. Are you ready to give this a try? 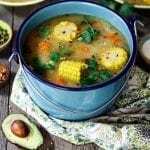 I hope you guys enjoyed learning a little about Ajiaco and maybe you’ll give it a try. 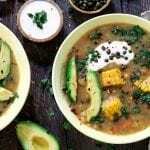 I’m looking forward to visiting Bogotá one day, and I would love to enjoy a vegan version of this incredibly delicious soup! 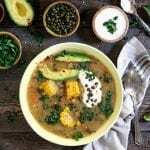 If you make this Vegan Ajiaco Soup, let me know what you think by ★ star rating it and leaving a comment below. It would really make my day. You can also follow me on Instagram and share your creation with me. Just tag me @veganhuggs and hashtag #veganhuggs so I don’t miss it. 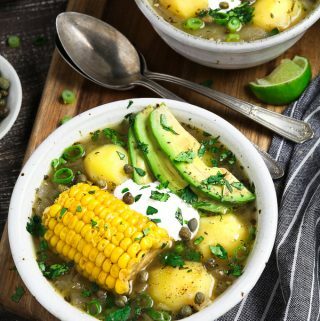 Ajiaco is a satisfying, one-pot meal that is made with 3 types of potatoes and served with sliced avocado, capers, and tangy cream. Your taste buds will dance! In a large soup pot, heat oil over medium heat & sprinkle with salt. Add onion and sauté until translucent, about 3-4 minutes. Raise heat to high, and add vegetable broth, red potatoes, russet potatoes, guascas, salt, and pepper. Once the soup starts to boil, put heat to medium-low to maintain a simmer, and cover pot partially with a lid. Cook for about 25-30 minutes, until the potatoes are breaking down. You can also mash the potatoes with a fork against the side of the pot to help it along. This thickens the soup and creates a stew-like consistency. Now add the yukon potatoes (or papas criollas), corn cobs, green onion and cilantro. Simmer for 15-20 minutes, until potatoes are tender and corn is cooked. Check for seasoning and add more if needed. While soup is finishing up, start preparing your selected garnishes. Remove from heat and add lime juice if preferred. Serve hot with sour cream, avocado slices, and capers. GUASCAS: you can find it in most Latin markets or you can find it on Amazon Here. It's really worth searching for and will give your Ajiaco its authentic flavor. If you want to make the soup without the Guascas, you can sub it with 1 teaspoon of thyme and 2 bay leaves. 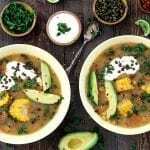 The soup won't have the same flavor as Ajiaco, but it will still be delicious and flavorful. POTATOES: Papas Criollas are 1 of the 3 potato types traditionally used for this recipe. They are small, golden-yellow potatoes with a buttery, nutty, creamy taste and texture. If you can find them, I highly recommend trying them out at least once. They are a little expensive, so most of the time, I just use Yukon Gold to replace them. CORN: If you're using frozen corn kernels, thaw them under cold water and add them to the soup the last 6-7 minutes of cooking time. If using frozen corn cobs, they can go in the pot at the same time as the fresh. *The capers are served on the side but are quite salty. Keep this in mind when adding additional salt to the recipe. *I highly recommend adding the vegan sour cream, capers, and avocado on the side to get the full Ajiaco experience. Additional garnish or side ideas: Serve with a side of rice, fresh-cut cilantro, lime wedges, or Aji (Colombian salsa). To reheat the soup, cook over medium heat and stir in a small amount of vegetable broth if needed. *I feel the Ajiaco is perfect without a chicken replacement. The guascas, potatoes, and sides are wonderful on their own. However, if you would like to have the additional texture. You can sautée Vegan Chick'n and serve it on the side. * For a thicker soup use 1-2 cups less broth or 1-2 cups more for a thinner consistency. Deeeelicious! Thank you for sharing! Thank you for posting this. First ate ajiaco in Bogota but now I need a meat free version. I haven’t made it, but I’m interested. I recently started taking Spanish classes and am going to delve into Latin American cooking. I found there’s a Latin American grocer half and hour from me, now I just need to find out if they have guascas. But I’m happy to read above that the recipe is good, even without it. Wow thi is exactly what I have been looking for! Ordering Guascas now! I brought some dried guascas home from Colombia last year and have beeen meaning to figure out how I could veganize ajiaco, but thanks to you I didn’t have to!! It was so nice to finally taste this soup that I heard so much about during my trip! It was so delicious! The guascas are really special, 1/3 cup looked like way too much, but it turned out to be just right!! Now I must track down more in the US! And I never knew there was such a thing as frozen corn on the cob, was very happy to learn this!! Worked really well in the soup, so much more fun than the kind that’s already been cut off the cob! Didn’t change a thing, and it was perfect. Thank you so much! Could your story no one cares about be ANY LONGER! ugh, it’s insufferable! Just give us the damn recipe. I made it tonight and this meal was amazing! I didn’t even add guascas (didn’t have any – But will take your advice and just order on amazon for next time) Also, the kids liked it too! I always love finding Vegan alternatives that otherwise traditionally would never stray from the meat version. I will be sharing this recipe with my Colombian mother-in-law. It’ll be interesting to hear what her take on this is. Thanks for sharing! I made it on the last day of 2017 and making it again today. New Vegan. Made this recipe tonight. Used parsley instead of cilantro and scallions instead of green onions but it was delicious! Thank you for sharing 🙂 Please keep adding tasty recipes to the blog. I might try the mushroom chili next! I made this tonight for my family. Everyone really enjoyed it. Thank you for the recipe. I am living in Bogota now and most places will laugh at you if you ask for a vegetarian version of Ajiaco let alone a vegan version. But, I am definitely going to try your recipe! Hey, at least I can easily find all the ingredients!! Made this dish and is super delicious! Even the carnivores in my family loved it! I added some Spanish olives and it was perfect.